Disney used tonight’s Grammy Awards on CBS to promote several of its upcoming movies, including its live-action remake of Dumbo. The new trailer begins with Danny DeVito’s Max Medici welcoming fans to the Medici Family Circus, along with shots of the massive circus itself. 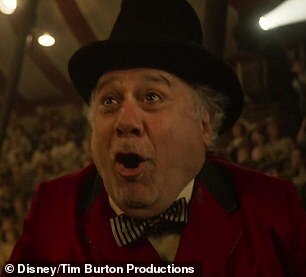 Medici tells the crowd that his circus is, ‘where anything can happen and miracles happen,’ along with a shot of Milly (Nico Parker) and Joe (Finley Hobbins) giving Dumbo a hug. There is also a brief shot of Joe handing a feather to Eva Green’s Colette Merchant, telling her, ‘he won’t fly without a feather,’ as Merchant eyes it curiously. Colin Farrell’s Holt Farrier is also seen saying, ‘All right, Dumbo, give me a show-stopper,’ while Milly says, ‘Fly Dumbo,’ before the elephant takes to the skies. Dumbo is seen taking an aerial lap around the circus tent, which astonishes both the assembled crowd and even Medici himself.